Whether you get a nanday conure, a jenday conure, or one of the other species, you need to invest in a large cage. Consider getting the largest cage your home can accommodate and that you can afford. If you can, you should opt for the stainless steel variety. They do cost more but will usually last for the life of your bird. You should pay close attention to the door of the cage, too. Look for a drawbridge-style opening door. Some of the other varieties can actually kill your bird. Also, make sure the cage has a steel grate separating the living area from the bird’s bathroom. The nanday conure diet should mainly consist of dry pellets. However, you want to supplement these pellets with fruits and vegetables. Cut up apples are a particular favorite for many nanday conure birds. They also seem to have a preference for dark green and orange vegetables. Don’t shy away from trying different types to see which items your bird loves. Just familiarize yourself with foods that are dangerous or toxic to birds, such as avocados, so you don’t inadvertently make your pet sick. You can feed seeds to your bird, but you should keep these as an occasional reward. They contain high amounts of fat – not a good thing for your bird to overindulge in. When you decide to purchase a nanday conure for sale, watch for signs that he may already be sick. Drab looking feathers are a good sign. Birds that hide their heads or that have noticeable discharge from their nostrils are ill and should not be purchased. At home, you can protect your bird from some of the most common ailments by keeping him away from drafts. Make sure you provide your nanday conure parrot with plenty of attention and stimulation so he doesn’t become bored. 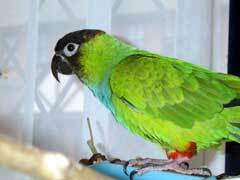 When conures become bored, they develop negative behaviors, such as screaming and biting. Giving your bird toys and interacting with him daily will prevent those problems from occurring. When you are deciding to adopt or buy a nanday conure, you should keep all of these facts in mind so you can make an informed choice that everyone in your family will be happy with.